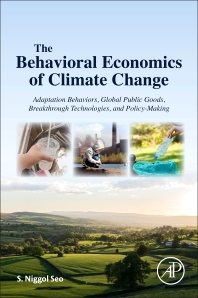 The Behavioral Economics of Climate Change: Adaptation Behaviors, Global Public Goods, Breakthrough Technologies, and Policy-Making shows readers how to understand mitigation strategies emerging from global warming policy discussions and the ways that changing climate conditions can alter these strategies. Through quantitative analyses, case studies and policy examples, this bottom-up approach to climate change economics gives readers the tools to create effective responses to global warming. This self-contained book on the topic covers key scientific and economic subjects in an applied, innovative and immediately relevant fashion. Prof. S. Niggol Seo is a natural resource economist who specializes in the study of global warming. He was born in a rural village in South Korea in 1972; he studied at Seoul National University and the University of California at Berkeley and received a PhD degree in Environmental and Natural Resource Economics from Yale University in May 2006 with a dissertation on microbehavioral models of global warming. While at Yale University, he learned from Robert Mendelsohn and William Nordhaus. Since 2003, he has worked with theWorld Bank on various climate change projects in Africa, Latin America, and Asia. He held professor positions in the United Kingdom, Spain, and Australia from 2006 to 2015. Since September 2015, he is Professor of Environmental & Natural Resource Economics at the Muaebak Institute of Global Warming Studies in Seoul, Korea. Prof. Seo has published four books and over 50 international journal articles on the economics of global warming. He frequently serves as a journal referee for more than 30 international journals and has been on the editorial boards of the two journals Food Policy and Applied Economic Perspectives and Policy. He received an Outstanding Applied Economic Perspectives and Policy Article Award from the Agricultural and Applied Economics Association in Pittsburgh in June 2011.